It is very easy to get lost in the turbulent sea of life. There are so many little and big waves that tug you in various directions. In no time at all you can find yourself somewhere you don’t belong. These are times when one feels lost and alone. In these moments we look for hope; a spark of inspiration to shine light into the darkness so that a path can be dreamt. In these moments we look for the Star. The Star provides a stable point of orientation. Above in the heavens, it does not get tossed and turned by the waves of fortune or pushed and pulled by the currents of passion. It stands still so that you can always reconnect to your true path. Up in the dark sky, your star shines for you. It is filled with the light of your soul gathered from all its various experiences. It has purpose, personality, frequency, color and light. It broadcasts these qualities without interfering. It stays quietly in the background; peaceful and loving along with your soul family and guides. The Star shines its cool brightness to remind of your divinity. It carries the message that you are originally a spark of light, made of ancient stardust, bright and luminous. You have qualities within you that are divine. Whenever you feel hopeless you can look up and be reminded of who you are so that you can find your way back to your original goodness. 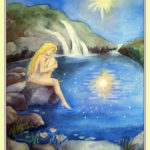 In this card a maiden sits in her original nakedness and soaks in the energies of her soul. She dips her foot into the cool waters of her emotional, intuitive realm. 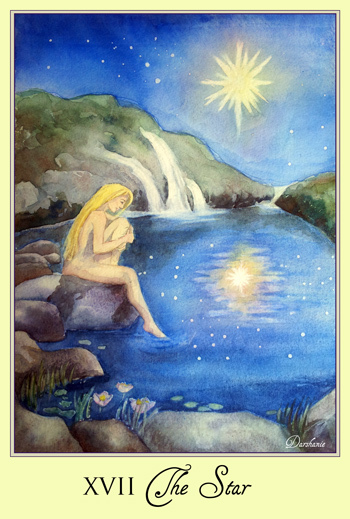 In this reflecting pool, she sees her special star. Waterfalls pour down like inspiration from above to nourish her heart. When you get the Star card, understand that you are not alone. There are those on higher levels that are there to assist you. Have hope. Life has a plan. If you feel lost, open yourself up to the guidance of your higher self. Remember you are part of this universe, put here through God’s grace. You are meant to be here. You might not know the whole picture, but your soul and the universe does. Ask higher realms for help. Keep company with those who support your light. Wish upon your star. Let it shine its light so that you may see your path.